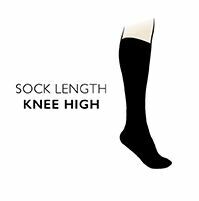 These natural bamboo knee high socks, available in a 2 pair pack, are exceptionally soft to the touch and combine maximum comfort with up to the minute fashion. The bamboo is environmentally friendly, has anti-bacterial and anti-allergenic properties and keeps feet cool in summer and warm in winter. Feet stay fresh and healthy and the bamboo also absorbs moisture. Stand out with confidence in comfort in the latest knee high socks.